Spalding Quibble ruled the roost. He shared with no one. Until, that is, his parents introduced … baby brother Bunny. Outraged at being usurped, Spalding declared WAR! Spalding was a creative lad. He concocted disasters and devised unprovoked attacks at every turn until his long suffering parents shouted ‘Time Out’. Then time did pass and Bunny grew. He followed Spalding everywhere. Regardless of the abuse big brother handed out, Bunny was not deterred. And his unswerving love eventually thawed his big brother’s heart. 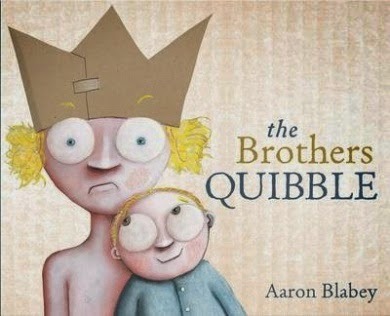 The Brothers Quibble is completely and utterly subversive. It explores all the negative feelings that go with adjusting to a new baby in the family. And yet, the awful truth can be just as, if not more, heart-warming than sugar coating. I could not get enough of the dastardly deeds of Spalding Quibble and his younger brother. Simply adorable.